Risotto is more than a warming winter dish: it is just as nice in summer with some chilled rosé. Heat the butter and oil in a lidded pan, add the shallots and celery, and cook for 3–4 minutes, stirring. Add the rice and stir until coated. Add the wine, stirring, until it is almost absorbed, then add most of the stock a ladleful at a time, stirring. When the rice is almost tender, around 12 minutes later, add the courgettes and cook for 4 minutes, stirring. Add the diced tomatoes, 2 tbsp Parmesan and one final ladleful of stock. Season, stir, cover, then rest for 2 minutes. Scorch the cherry tomatoes in a non-stick frying pan until they're heated through. 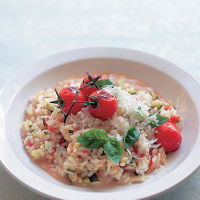 Serve the risotto scattered with basil leaves, Parmesan and scorched tomatoes. This recipe was first published in June 2007.